Logano’s path to his third Xfinity Series win on Watkins Glen International’s historic 2.45-mile/11-turn layout was cleared when Keselowski spun while pressuring him for the lead barreling into Turn 1 on Lap 79 of the 82-lap/200.9-mile event. With “Bad Brad” sliding out of his rearview mirror, Logano pulled away to a 3.362-second margin of victory over runnerup AJ Allmendinger _ like Logano and Keselowski a regular in the Monster Energy NASCAR Cup Series. Xfinity Series regular Justin Allgaier rounded-out the podium in third. 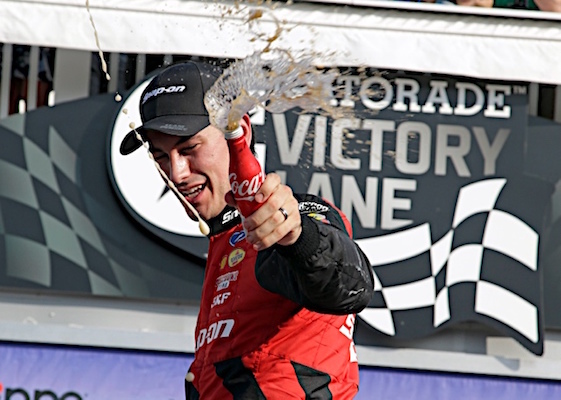 Logano scored his 30th career Xfinity Series victory in 173 starts after qualifying on-pole Saturday morning. All three of Logano’s Xfinity wins have come from P1. Fittingly, Keselowski started alongside in the two-car front row. The teammates eventually settled into their intramural battle after Logano took the lead from a surprisingly strong Ryan Preece with a bold, three-wide pass on the inside of Turn 1 during a restart on Lap 75. Four laps later, the issue became moot when Keselowski put himself into the spin cycle en route to a 10th-place finish in his No. 12 Ford. The race took on an added element when rain started falling with 11 laps remaining in Stage 2. NASCAR instructed the field to pit for wet weather tires _ a tire that was last run in the series at Mid-Ohio Sports Car Course in 2016. Some teams also used the stop to attach a windshield wiper mandated by the sanctioning body for the conditions. Allmendinger, Logano and Allgaier led the field when the wet track went “green” on Lap 33 _ a stint that ended two laps later when rookie Vinnie Miller plowed his No. 01 teamjdmotorsports.com Chevrolet Camaro off-track and into the Turn 1 tire barrier after losing grip. The race was red-flagged for 10 minutes, 24 seconds to allow the track’s crew to repair the barrier. Stage 2 finished on Lap 40 with Allmendinger, Allgaier and Cup regular Kyle Larson at the point. By that time, the track began to dry and teams changed back to slick tires for the remainder of the race. The rain also prompted Brian Wilson, Logano’s crew chief, to reconfigure his game plan for a race that began under sunny skies and temperatures in the 80s. Allmendinger’s runnerup result was especially stout, considering NASCAR’s pit road police cited him for pitting outside his box during a green flag stop for fuel only on Lap 52. Allgaier, meanwhile, lost a battle with Allmendiger for second on the final lap after contact moments earlier. “The last restart we had some contact (with Allmendinger) and I thought I was going to spin out,” said Allgaier, driver of the No. 7 Camaro. “I thought I was going to run into him and I didn’t want to run into him for one sport, second or third. Not that I didn’t want to finish second but he did a better job and AJ’s a fantastic road-racer. Still, a solid day. Saturday’s race was the first of three on natural-terrain road-courses for the series this month. Visits to 2.258-mile Mid-Ohio Sports Car Course in Lexington, Ohio, on Aug. 11 and 4-mile Road America layout in Elkhart Lake, Wis., on Aug. 25 are sandwiched around the tour’s annual nighttime extravaganza on Bristol Motor Speedway’s high-banked/half-mile bull-ring on Aug. 17. Logano, who won Stage 1, led three times for a race-high 31 laps, five more than Keselowski. Team Penske now has scored seven wins in the Zippo 200 with four different drivers _Ryan Newman (2005), Kurt Busch (2006 and 2011), Keselowski (2013) and Logano (2015, 2016 and 2018). Preece, who led eight laps, finished fourth in his No. 18 Craftsman Toyota while Aric Almirola was fifth in the No. 98 Ford. Point-leader Christopher Bell saw his three-race winning streak end with a ninth-place finish in the No. 20 Toyota Camry. However, the Joe Gibbs Racing rookie still leads the championship standings by 22 points over Cole Custer after his sixth-place finish in the No. 00 Ford. And Bell, who cut his racing teeth on the dirt tracks of Oklahoma and Texas, said competing in the rain was cool.